In today’s increasingly litigious environment it makes sense to analyse and minimise risks. An effective health and safety regime reduces the risks of accidents, and robust health and safety practices can also reduce the cost of insurance too. Not only is instilling a safety conscious compliant culture in an organisation important to manage risks; it is a statutory responsibility. Our health and safety consultants provide pragmatic health and safety solutions. 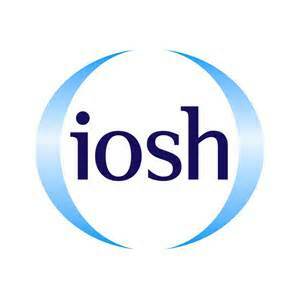 Furthermore clients have the assurance that all our consultants are NEBOSH or IOSH qualified or equivalent. 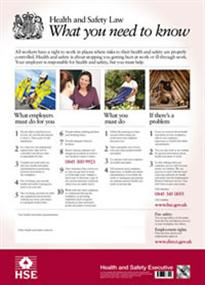 Legally employers with five or more staff working on a site simultaneously are required to have a health and safety policy. In addition, employers must evaluate and minimise the risks from hazards. Employers should be seeking to reduce exposure to risk. Employers employing five or more staff should record risk assessments. *Item may also be given to each individual employee rather than displayed. **Item may be displayed electronically, most private companies are required to hold Employers’ Liability Insurance. 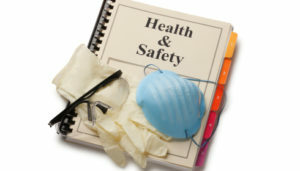 Our health and safety consultants work in a range of industries. As a result, our consultants can apply that breadth of experience to adapt and find solutions to meet clients’ needs. In addition, our consultants are familiar with the latest developments and best practice. At HR First we understand the vying pressures of running a business and that’s why we’ve developed our health and safety monitoring service. Designed to enable and support business owners to fulfil their health and safety statutory responsibilities in a systematic managed way, but which is paced over a 12 month cycle to minimise disruption and to accommodate each client’s unique business cycle. Each quarterly visit is focused on a specific outcome to ensure that over the 12 month cycle all statutory requirements are completed. In addition at each site visit an audit is conducted; the regular discipline of the audit ensures timely monitoring and follow-up of identified existing outstanding issues and the risk of new hazards not being identified in a timely manner is minimised. At the end of each visit a summary report is produced setting out the findings, recommendations and actions. Our bespoke health and safety audit report, collates actions and provides measurable and meaningful feedback on progress. On-going support between site visits is available via telephone or email. Clients can be assured that should something happen our health and safety consultants are available to support clients with accident investigations, RIDDOR submissions and health and safety awareness training where required. We also offer practical employment law advice and HR Services , support with setting up auto enrolment pensions and benefits to thus enabling business owners to concentrate on running their business.